E. of Dundonald against Bar. De Gols against Ward & al. With a Bill, intituled, "An Act for granting an Aid to His Majesty, by a Land Tax, to be raised in Great Britain, for the Service of the Year One Thousand Seven Hundred and Thirty-seven;" to which they desire the Concurrence of this House. With a Bill, intituled, "An Act for making navigable the River or Brook called Worsley Brook, from Worsley Mill, in the Township of Worsley, in the County Palatine of Lancaster, to the River Irwell, in the said County;" to which they desire the Concurrence of this House. Gaol, &c. in Bucks, Bill. With a Bill, intituled, "An Act to empower the Justices of the Peace for the County of Bucks to raise Money, to discharge the Debts incurred on account of building a Gaol and Court Room; and for finishing the same, for the Use of the County;" to which they desire the Concurrence of this House. Rollo to sue, notwithstanding, his Attainder, Bill. 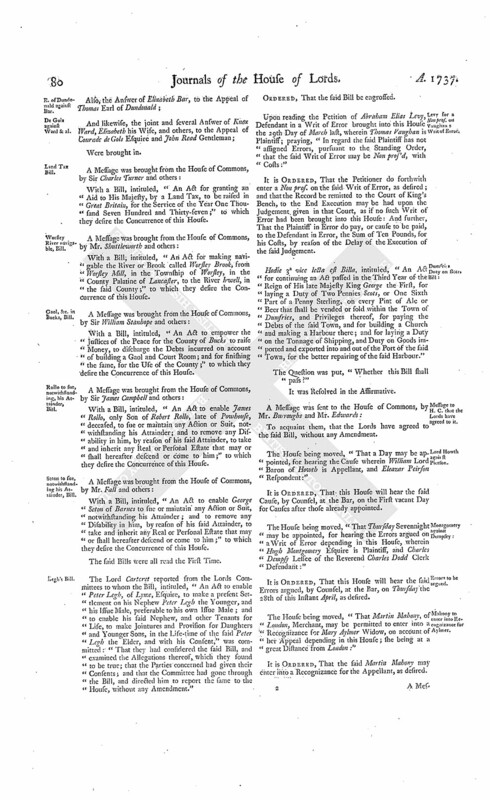 With a Bill, intituled, "An Act to enable James Rollo, only Son of Robert Rollo, late of Powhouse, deceased, to sue or maintain any Action or Suit, notwithstanding his Attainder; and to remove any Disability in him, by reason of his said Attainder, to take and inherit any Real or Personal Estate that may or shall hereafter descend or come to him;" to which they desire the Concurrence of this House. Seton to sue, notwithstanding his Attainder, Bill. With a Bill, intituled, "An Act to enable George Seton of Barnes to sue or maintain any Action or Suit, notwithstanding his Attainder; and to remove any Disability in him, by reason of his said Attainder, to take and inherit any Real or Personal Estate that may or shall hereafter descend or come to him;" to which they desire the Concurrence of this House. The Lord Carteret reported from the Lords Committees to whom the Bill, intituled, "An Act to enable Peter Legh, of Lyme, Esquire, to make a present Settlement on his Nephew Peter Legh the Younger, and his Issue Male, preferable to his own Issue Male; and to enable his said Nephew, and other Tenants for Life, to make Jointures and Provision for Daughters and Younger Sons, in the Life-time of the said Peter Legh the Elder, and with his Consent," was committed: "That they had considered the said Bill, and examined the Allegations thereof, which they found to be true; that the Parties concerned had given their Consents; and that the Committee had gone through the Bill, and directed him to report the same to the House, without any Amendment." Levy for a Non pros. on Vaughan's Writ of Error. Upon reading the Petition of Abraham Elias Levy, Defendant in a Writ of Error brought into this House the 29th Day of March last, wherein Thomas Vaughan is Plaintiff; praying, "In regard the said Plaintiff has not assigned Errors, pursuant to the Standing Order, that the said Writ of Error may be Non pros'd, with Costs:"
It is Ordered, That the Petitioner do forthwith enter a Non pros. on the said Writ of Error, as desired; and that the Record be remitted to the Court of King's Bench, to the End Execution may be had upon the Judgement given in that Court, as if no such Writ of Error had been brought into this House: And further, That the Plaintiff in Error do pay, or cause to be paid, to the Defendant in Error, the Sum of Ten Pounds, for his Costs, by reason of the Delay of the Execution of the said Judgement. Hodie 3a vice lecta est Billa, intituled, "An Act for continuing an Act passed in the Third Year of the Reign of His late Majesty King George the First, for laying a Duty of Two Pennies Scots, or One Sixth Part of a Penny Sterling, on every Pint of Ale or Beer that shall be vended or sold within the Town of Dumfries, and Privileges thereof, for paying the Debts of the said Town, and for building a Church and making a Harbour there; and for laying a Duty on the Tonnage of Shipping, and Duty on Goods imported and exported into and out of the Port of the said Town, for the better repairing of the said Harbour." The House being moved, "That a Day may be appointed, for hearing the Cause wherein William Lord Baron of Howth is Appellant, and Eleazar Peirson Respondent:"
The House being moved, "That Thursday Sevennight may be appointed, for hearing the Errors argued on a Writ of Error depending in this House, wherein Hugh Montgomery Esquire is Plaintiff, and Charles Dempsy Lessee of the Reverend Charles Dodd Clerk Defendant:"
It is Ordered, That this House will hear the said Errors argued, by Counsel, at the Bar, on Thursday the 28th of this Instant April, as desired. Mahony to enter into Recognizance for Aylmer. The House being moved, "That Martin Mahony, of London, Merchant, may be permitted to enter into a Recognizance for Mary Aylmer Widow, on account of her Appeal depending in this House; she being at a great Distance from London:"
It is Ordered, That the said Martin Mahony may enter into a Recognizance for the Appellant, as desired. To return the Bill, intituled, "An Act to enable the Trustees and Testamentary Guardians named in the Will of Thomas Hesketh, late of Rufford, in the County of Lancaster, Esquire, deceased, to perform the same, and make Leases for Lives in his settled Estate, for paying his Debts during his Sons Minority, in Ease of an Estate devised by him to be sold;" and to acquaint this House, that they have agreed to the same, without any Amendment. and Lord Hobart's Bill, for Sale of Gunnersbury House. To return the Bill, intituled, "An Act for Sale of the Capital Messuage of Gunnersbury, and other Lands and Hereditaments, late the Estate of Sir John Maynard Knight, Serjeant at Law; and for purchasing another Estate, to be settled to the Uses of his Will;" and to acquaint this House, that they have agreed to the same, without any Amendment. With a Bill, intituled, "An Act for collecting, at the Port of Leghorn, certain small Sums of Money, to which the Merchants trading there have usually contributed, for the Relief of shipwrecked Mariners, Captives, and other distressed Persons, His Majesty's Subjects; and for other charitable and public Uses;" to which they desire the Concurrence of this House. With a Bill, intituled, "An Act for naturalizing Bartholomew Baratty;" to which they desire the Concurrence of this House. Ordered, That the Gentleman Usher of the Black Rod do bring Alexander Wilson Esquire, Provost of Edinburgh, to the Bar of this House, To-morrow, in order to his being bailed. Ordered, That the authencic Extract of the Proceedings in the Trial of Captain John Porteous, laid before this House the Third of March last, be taken into Consideration on Thursday next. Ordered, That the several Persons from Scotland, who were required to attend this Day, do attend this House To-morrow Sevennight. Hodie 2a vice lecta est Billa, intituled, "An Act for the Encouragement of Learning, by the more effectual securing the sole Right of printing Books to the Authors thereof, their Executors, Administrators, or Assigns, during the Times therein mentioned; and to repeal an Act passed in the Eighth Year of the Reign of Her late Majesty Queen Anne, intituled, "An Act for the Encouragement of Learning, by vesting the Copies of printed Books in the Authors or Purchasers of such Copies, during the Times therein mentioned;" and for the better securing the Payment of the Drawback of the Duties for Paper, used in printing Books in the Latin, Greek, Oriental, and Northern Languages, within the Two Universities of Oxford and Cambridge, so far as the said Drawback relates to Paper made in Great Britain." Proceedings and Trials in the Court of Justiciary, &c. delivered. 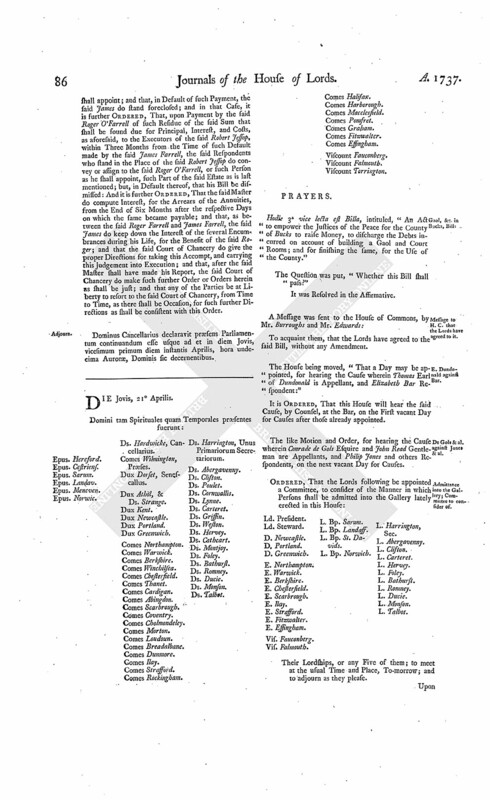 This Day was laid before the House, pursuant to their Lordships Order of the 23d of March last, "The Extract of the Proceedings before James Graham of Airth Esquire, Judge of the High Court of Admiralty in Scotland, in the Action at the Instance of Duncan Forbes Esquire, His Majesty's Advocate, and Mr. Hugh Forbes Advocate Procurator Fiscal of the said High Court, against Thomas Mc Adams Soldier, and James Long Corporal, in the Regiment of Foot commanded by Colonel Hamilton." Also, "The authentic Extract of the Proceedings before the Court of Justiciary, in the Suspension of the Sentence of Death, pronounced by the Judge of the High Court of Admiralty, against James Long and Thomas Mc Adams." Together with, "The authentic Copy of the Trial of William Haunt Dragoon, in the Year 1711." And, "The authentic Copy of the Trial of Scot and Mackpherson, in the Year 1712." Dominus Cancellarius declaravit præsens Parliamentum continuandum esse usque ad et in diem Martis, decimum nonum diem instantis Aprilis, hora undecima Auroræ, Dominis sic decernentibus. Epus. Asaph. Ds. Hardwicke, Cancellarius. Hodie 2a vice lecta est Billa, intituled, "An Act for granting an Aid to His Majesty, by a Land Tax, to be raised in Great Britain, for the Service of the Year One Thousand Seven Hundred and Thirtyseven." Mountfort to take the Name of Grosvenor, Bill. Hodie 3a vice lecta est Billa, intituled, "An Act to enable Edward Mountfort, and his Issue Male by Mary his now Wife, to take and use the Surname of Grosvenor." Hodie 3a vice lecta est Billa, intituled, "An Act to enable Peter Legh, of Lyme, Esquire, to make a present Settlement on his Nephew Peter Legh the Younger, and his Issue Male, preferable to his own Issue Male; and to enable his said Nephew and other Tenants for Life to make Jointures and Provision for Daughters and Younger Sons, in the Lifetime of the said Peter Legh the Elder, and with his Consent." Hodie 2a vice lecta est Billa, intituled, "An Act to empower the Justices of the Peace for the County of Bucks to raise Money, to discharge the Debts incurred on account of building a Gaol and Court Room; and for finishing the same, for the Use of the County." Vis. Falmouth. L. Abp. Cant. Hodie 2a vice lecta est Billa, intituled, "An Act for making navigable the River or Brook called Worsley Brook, from Worsley Mill, in the Township of Worsley, in the County Palatine of Lancaster, to the River Irwell, in the said County." Wilson, Provost of Edinburgh, Bail approved of. The Earl of Finlater reported from the Lords Committees appointed to consider of the Sufficiency of the Bail offered by Alexander Wilson Esquire, Provost of Edinburgh: "That John Blackwood and Claud Johnson, having been examined, upon their Oaths, had severally sworn themselves worth One Thousand Pounds each, all Debts paid; and that the Committee are of Opinion, that they are sufficient Bail." "Alexander Wilson Armiger recognovit se debere Domino Regi Duas Mille Libras, levari de Bonis, Catallis, Terris, et Tenementis suis, ad Usum dicti Domini Regis. "Johannes Blackwood recognovit se debere Domino Regi Mille Libras, levari de Bonis, Catallis, Terris, et Tenementis suis, ad Usum dicti Domini Regis. "Claudius Johnson recognovit se debere Domino Regi Mille Libras, levari de Bonis, Catallis, Terris, et Tenementis suis, ad Usum dicti Domini Regis. 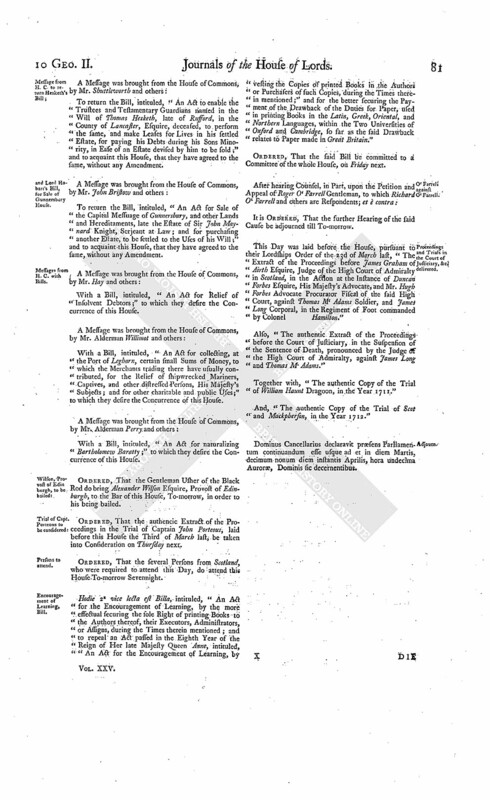 "Upon Condition, That if the said Alexander Wilson shall appear personally before the Lords in Parliament, at such Times as their Lordships shall proceed upon the Bill, intituled, "An Act to disable Alexander Wilson Esquire from taking, holding, or enjoying, any Office or Place of Magistracy, in the City of Edinburgh, or elsewhere in Great Britain; and for imprisoning the said Alexander Wilson; and for abolishing the Guard kept up in the said City, commonly called The Town Guard; and for taking away the Gates, of The Nether Bow Port of the said City, and keeping open the same;" and at such other Times, during this Session of Parliament, as he shall be required by this House; then the said several Recognizances, of the said Alexander Wilson, John Blackwood, and Claud Johnson, shall be void and of none Effect; or else to be and remain in full Force and Virtue." Which done, they were all directed to withdraw. The Earl of Warwick reported from the Lords Committees to whom the Bill, intituled, "An Act for establishing and confirming a Partition of the Estates of Sir Robert Furnese Baronet, deceased, among his Three Daughters and Coheirs; and for settling their several specific Shares and Allotments to such Uses as their several undivided Third Parts thereof stood limited before such Partition; and for other Purposes therein mentioned," was committed: "That they had considered the said Bill, and examined the Allegations thereof, which they found to be true; that the Parties concerned had given their Consents; and that the Committee had gone through the Bill, and made some Amendments thereunto." Harvey to take the Name of Thursby, Bill. The Earl of Warwick also reported from the Lords Committees to whom the Bill, intituled, "An Act to enable John Harvey Esquire, now called John Thursby, to take and use the Surname and Arms of Thursby, in Pursuance of the Will of William Thursby Esquire, deceased," was committed: "That they had considered the said Bill, and examined the Allegations thereof, which were found to be true; and that the Committee had gone through the Bill, and directed him to report the same to the House, without any Amendment." Hodie 2a vice lecta est Billa, intituled, "An Act for making navigable the River Rodon, from a little below a Mill called Barking Mill, in the County of Essex, to Illford Bridge, in the said County." Hodie 1a vice lecta est Billa, intituled, "An Act for collecting, at the Port of Leghorn, certain small Sums of Money, to which the Merchants trading there have usually contributed, for the Relief of shipwrecked Mariners, Captives, and other distressed Persons, His Majesty's Subjects; and for other charitable and public Uses." Trials in Scotland to be printed. Ordered, That the Extract of the Proceedings in the High Court of Admiralty in Scotland, against Thomas McAdams and James Long; as also the Extract of the Proceedings before the Court of Justiciary, in the Suspension of the Sentence of Death against the said McAdams and Long; together with the Trials of William Haunt in the Year 1711, and of Scot and Mackpherson in the Year 1712, laid before this House Yesterday, be printed. Account of Rioters in Scotland delivered. 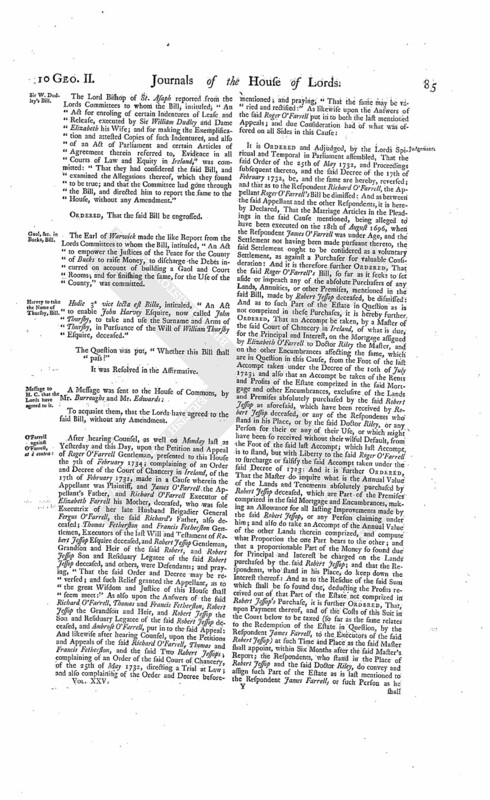 An Account of the Names of such Persons as are charged, by Criminal Letters, with being guilty of the Riot in which Captain Porteous was murdered, being supposed to have sled from Justice, and who, by the said Letters, are charged to appear before the Court of Justiciary the 13th Day of June next." O' Farrell against O' Farrell, &c.
It is Ordered, That the further Hearing of the said Cause be adjourned till To-morrow; and that the Cause for that Day be put off till Monday next; and the Cause for Friday next to the Wednesday following; and the other Causes on Cause-days removed in Course. Qualifying Trustees for Highways, Bill. 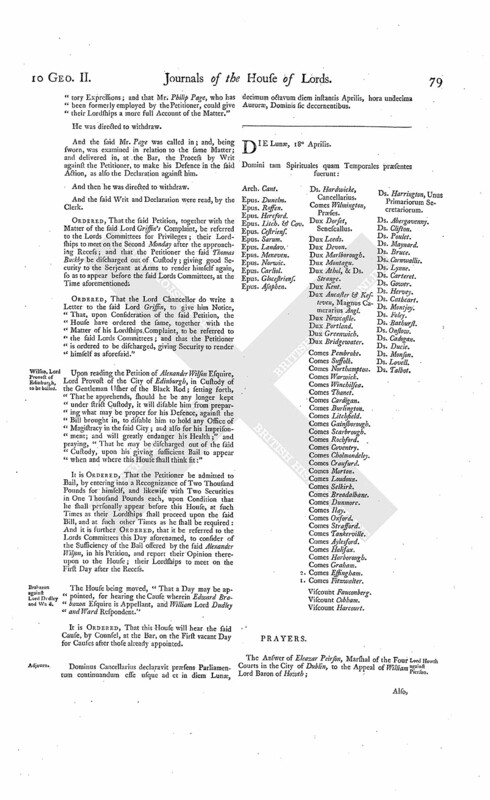 The Order of the Day being read, for the House to be put into a Committee upon the Bill, intituled, "An Act for the Qualification of Persons acting as Trustees for repairing the Highways and Roads within that Part of Great Britain called England; for enlarging the Number of Trustees; and giving them Power to inspect, and take Copies of, Books and Accompts relating to such Highways and Roads." Dominus Cancellarius declaravit præsens Parliamentum continuandum esse usque ad et in diem Mercurii, vicesimum diem instantis Aprilis, hora undecima Auroræ, Dominis sic decernentibus. Hodie 3a vice lecta est Billa, intituled, "An Act for establishing and confirming a Partition of the Estates of Sir Robert Furnese Baronet, deceased, among his Three Daughters and Coheirs; and for settling their several specific Shares and Allotments to such Uses as their several undivided Third Parts thereof stood limited before such Partition; and for other Purposes therein mentioned." Hodie 2a vice lecta est Billa, intituled, "An Act for collecting, at the Port of Leghorn, certain small Sums of Money, to which the Merchants trading there have usually contributed, for the Relief of shipwrecked Mariners, Captives, and other distressed Persons, His Majesty's Subjects; and for other charitable and public Uses." The House (according to Order) was adjourned during Pleasure, and put into a Committee upon the Bill, intituled, "An Act for granting an Aid to His Majesty, by a Land Tax, to be raised in Great Britain, for the Service of the Year One Thousand Seven Hundred and Thirty-seven." 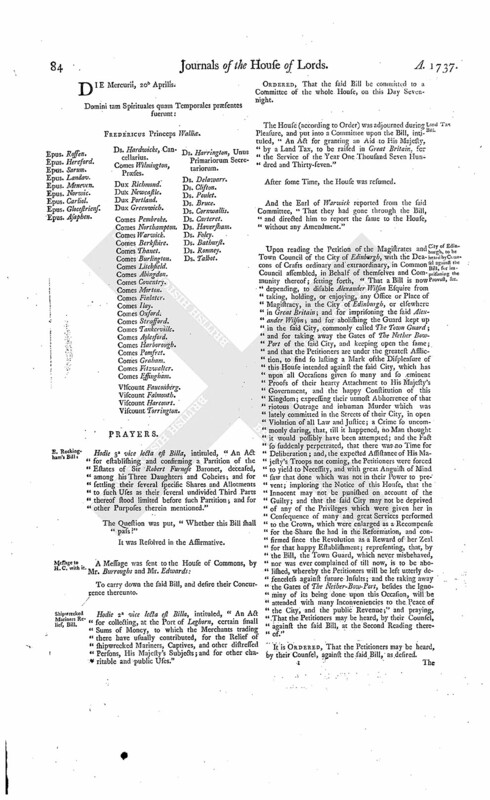 City of Edinburgh, to be heard by Counsel against the Bill, for imprisoning the Provost, &c.
Upon reading the Petition of the Magistrates and Town Council of the City of Edinburgh, with the Deacons of Crafts ordinary and extraordinary, in Common Council assembled, in Behalf of themselves and Community thereof; setting forth, "That a Bill is now depending, to disable Alexander Wilson Esquire from taking, holding, or enjoying, any Office or Place of Magistracy, in the City of Edinburgh, or elsewhere in Great Britain; and for imprisoning the said Alexander Wilson; and for abolishing the Guard kept up in the said City, commonly called The Town Guard; and for taking away the Gates of The Nether BowPort of the said City, and keeping open the same; and that the Petitioners are under the greatest Affliction, to find so lasting a Mark of the Displeasure of this House intended against the said City, which has upon all Occasions given so many and so eminent Proofs of their hearty Attachment to His Majesty's Government, and the happy Constitution of this Kingdom; expressing their utmost Abhorrence of that riotous Outrage and inhuman Murder which was lately committed in the Streets of their City, in open Violation of all Law and Justice; a Crime so uncommonly daring, that, till it happened, no Man thought it would possibly have been attempted; and the Fact so suddenly perpetrated, that there was no Time for Deliberation; and, the expected Assistance of His Majesty's Troops not coming, the Petitioners were forced to yield to Necessity, and with great Anguish of Mind saw that done which was not in their Power to prevent; imploring the Notice of this House, that the Innocent may not be punished on account of the Guilty; and that the said City may not be deprived of any of the Privileges which were given her in Consequence of many and great Services performed to the Crown, which were enlarged as a Recompense for the Share she had in the Reformation, and confirmed since the Revolution as a Reward of her Zeal for that happy Establishment; representing, that, by the Bill, the Town Guard, which never misbehaved, nor was ever complained of till now, is to be abolished, whereby the Petitioners will be left utterly defenceless against future Insults; and the taking away the Gates of The Nether-Bow-Port, besides the Ignominy of its being done upon this Occasion, will be attended with many Inconveniencies to the Peace of the City, and the public Revenue;" and praying, That the Petitioners may be heard, by their Counsel, against the said Bill, at the Second Reading thereof." It is Ordered, That the Petitioners may be heard, by their Counsel, against the said Bill, as desired. 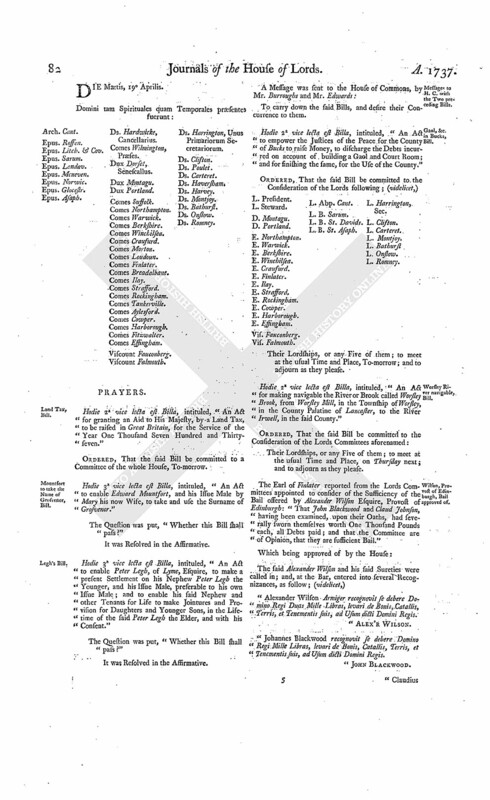 The Lord Bishop of St. Asaph reported from the Lords Committees to whom the Bill, intituled, "An Act for enroling of certain Indentures of Lease and Release, executed by Sir William Dudley and Dame Elizabeth his Wife; and for making the Exemplification and attested Copies of such Indentures, and also of an Act of Parliament and certain Articles of Agreement therein referred to, Evidence in all Courts of Law and Equity in Ireland," was committed: "That they had considered the said Bill, and examined the Allegations thereof, which they found to be true; and that the Committee had gone through the Bill, and directed him to report the same to the House, without any Amendment." The Earl of Warwick made the like Report from the Lords Committees to whom the Bill, intituled, "An Act to empower the Justices of the Peace for the County of Bucks to raise Money, to discharge the Debts incurred on account of building a Gaol and Court Rooms; and for finishing the same, for the Use of the County," was committed. Hodie 3a vice lecta est Billa, intituled, "An Act to enable John Harvey Esquire, now called John Thursby, to take and use the Surname and Arms of Thursby, in Pursuance of the Will of William Thursby Esquire, deceased." 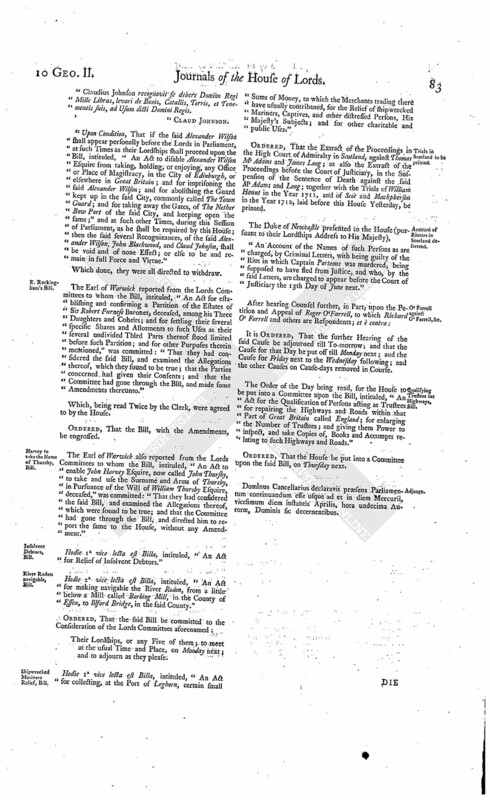 It is Ordered and Adjudged, by the Lords Spiritual and Temporal in Parliament assembled, That the said Order of the 25th of May 1732, and Proceedings subsequent thereto, and the said Decree of the 17th of February 1732, be, and the same are hereby, reversed; and that as to the Respondent Richard O'Farrell, the Appellant Roger O'Farrell's Bill be dimissed: And as between the said Appellant and the other Respondents, it is hereby Declared, That the Marriage Articles in the Pleadings in the said Cause mentioned, being alleged to have been executed on the 18th of August 1696, when the Respondent James O'Farrell was under Age, and the Settlement not having been made pursuant thereto, the said Settlement ought to be considered as a voluntary Settlement, as against a Purchaser for valuable Consideration: And it is therefore further Ordered, That the said Roger O'Farrell's Bill, so far as it seeks to set aside or impeach any of the absolute Purchasers of any Lands, Annuities, or other Premises, mentioned in the said Bill, made by Robert Jessop deceased, be dismissed: And as to such Part of the Estate in Question as is not comprized in these Purchases, it is hereby further Ordered, That an Accompt be taken, by a Master of the said Court of Chancery in Ireland, of what is due, for the Principal and Interest, on the Mortgage assigned by Elizabeth O'Farrell to Doctor Riley the Master, and on the other Encumbrances affecting the same, which are in Question in this Cause, from the Foot of the last Accompt taken under the Decree of the 10th of July 1723; and also that an Accompt be taken of the Rents and Profits of the Estate comprized in the said Mortgage and other Encumbrances, exclusive of the Lands and Premises absolutely purchased by the said Robert Jessop as aforesaid, which have been received by Robert Jessop deceased, or any of the Respondents who stand in his Place, or by the said Doctor Riley, or any Person for their or any of their Use, or which might have been so received without their wilful Default, from the Foot of the said last Accompt; which last Accompt is to stand, but with Liberty to the said Roger O'Farrell to surcharge or falsify the said Accompt taken under the said Decree of 1723: And it is further Ordered, That the Master do inquite what is the Annual Value of the Lands and Tenements absolutely purchased by Robert Jessop deceased, which are Part of the Premises comprized in the said Mortgage and Encumbrances, making an Allowance for all lasting Improvements made by the said Robert Jessop, or any Person claiming under him; and also do take an Accompt of the Annual Value of the other Lands therein comprized, and compute what Proportion the one Part bears to the other; and that a proportionable Part of the Money so found due for Principal and Interest be charged on the Lands purchased by the said Robert Jessop; and that the Respondents, who stand in his Place, do keep down the Interest thereof: And as to the Residue of the said Sum which shall be so found due, deducting the Profits received out of that Part of the Estate not comprized in Robert Jessop's Purchase, it is further Ordered, That, upon Payment thereof, and of the Costs of this Suit in the Court below to be taxed (so far as the same relates to the Redemption of the Estate in Question, by the Respondent James Farrell, to the Executors of the said Robert Jessop) at such Time and Place as the said Master shall appoint, within Six Months after the said Master's Report; the Respondents, who stand in the Place of Robert Jessop and the said Doctor Riley, do convey and assign such Part of the Estate as is last mentioned to the Respondent James Farrell, or such Person as he shall appoint; and that, in Default of such Payment, the said James do stand foreclosed; and in that Case, it is further Ordered, That, upon Payment by the said Roger O'Farrell of such Residue of the said Sum that shall be found due for Principal, Interest, and Costs, as aforesaid, to the Executors of the said Robert Jessop, within Three Months from the Time of such Default made by the said James Farrell, the said Respondents who stand in the Place of the said Robert Jessop do convey or assign to the said Roger O'Farrell, or such Person as he shall appoint, such Part of the said Estate as is last mentioned; but, in Default thereof, that his Bill be dismissed: And it is further Ordered, That the said Master do compute Interest, for the Arrears of the Annuities, from the End of Six Months after the respective Days on which the same became payable; and that, as between the said Roger Farrell and James Farrell, the said James do keep down the Interest of the several Encumbrances during his Life, for the Benefit of the said Roger; and that the said Court of Chancery do give the proper Directions for taking this Accompt, and carrying this Judgement into Execution; and that, after the said Master shall have made his Report, the said Court of Chancery do make such further Order or Orders herein as shall be just; and that any of the Parties be at Liberty to resort to the said Court of Chancery, from Time to Time, as there shall be Occasion, for such further Directions as shall be consistent with this Order. Dominus Cancellarius declaravit præsens Parliamentum continuandum esse usque ad et in diem Jovis, vicesimum primum diem instantis Aprilis, hora undecima Auroræ, Dominis sic decernentibus.